As always, we try to keep our Scheduler .NET control up-to-date and easy to use. Nowadays it supports all the latest .NET frameworks and IDEs, including ASP.NET 4.5 and Visual Studio 2012. With regard to all recent updates, your remarks and fixed bugs, we decided to give you further setup instructions. This time we explain how Scheduler .NET setup process can be reduced to only 5 steps that you can cover in less than 5 minutes. This article represents a step-by-step guide on how to create a simple yet elegant Google-like calendar/scheduler in ASP.NET MVC3/MVC4 Razor (C#). Create a new project in Visual Studio by selecting ASP.NET MVC 3/ MVC4 Web Application from the list. The project template should be empty. The view engine is Razor by default. We will create a simple scheduler in C#. The next step is to set up a database. Right-click on "Your_project_name" (e.g. 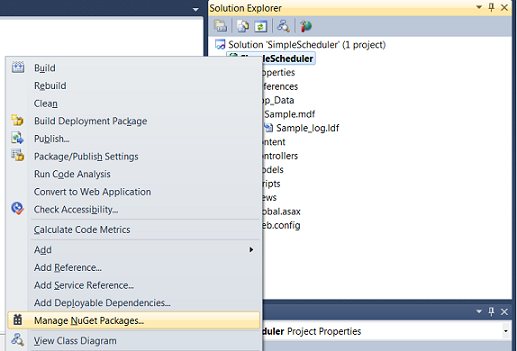 SimpleScheduler) -> Add -> Add ASP.NET Folder -> App_Data -> Add New Item and name it "Sample.mdf". A new database has been created. For ASP.NET MVC4 project the folder App_Data is created automatically. To see the updates, remember to refresh connection in the Server Explorer. To save your time, install MVC3 Sample first. 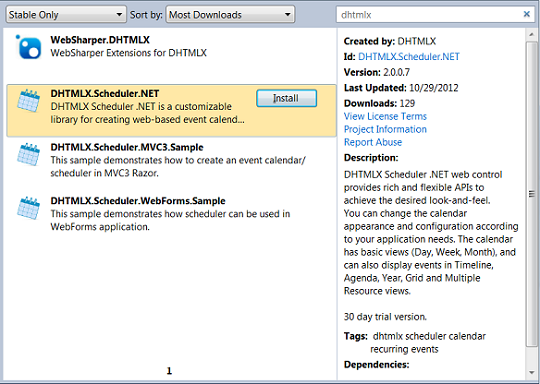 It contains the basic template of Scheduler .NET calendar control. 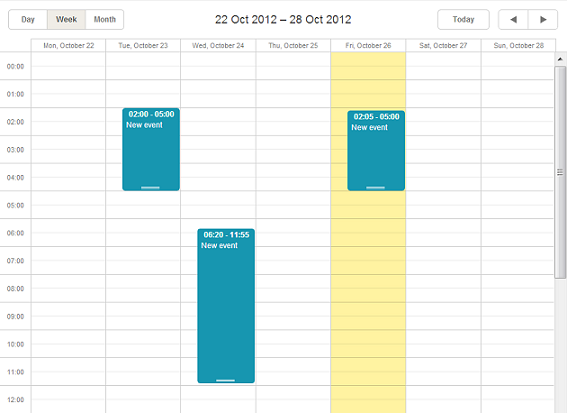 The template includes a controller with three actions (initialization, data load and save) and view with a calendar. The installed MVC3 Sample also contains a sample class model. You donâ€™t need it and can delete it. To create a new model right-click on the folder Models -> Add New Item. 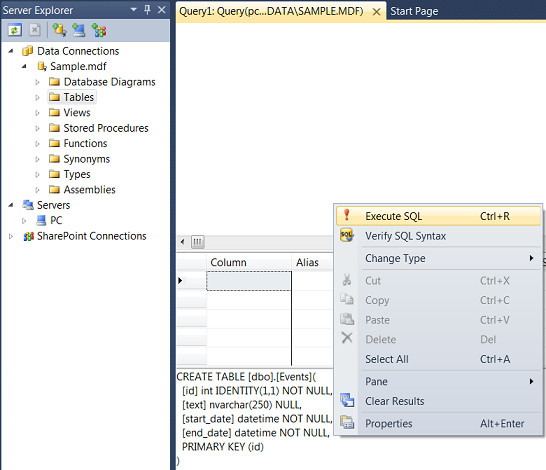 In the newly opened window choose LINQ to SQL Classes and name it "Sample.dbml". 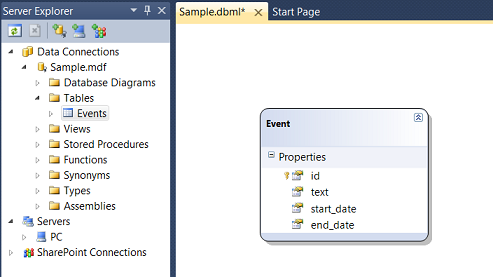 Double click it to open a visual editor and drag the "Event" table from the Server Explorer to the Editor. As stated above, the controller has been created when you installed MVC3 Sample. It contains action templates for data load and save, working with static data. Let's update the methods in CalendarController.cs to connect the controller with the newly created Model. We have changed the Model class used in the method. We've also added the required methods from LINQ to SQL and a helper that updates all object properties in the data base (except for the id). If a new event is added to the data base, an id assigned to the new event in the data base should be returned to the client. It returns TargetId of the object itself.